Just quickly before the serious life of life (a.k.a. work) starts again: Pictures of the gala last night. And look at that parade of tiaras! And orders. (That's new!) 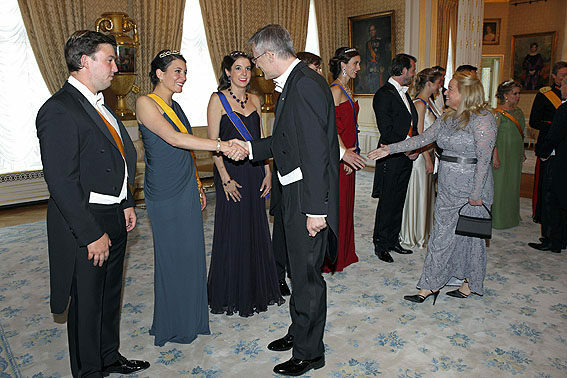 Order of the Gold Lion of the House of Nassau for all born members of the family plus the Grand Duchess; Order of Adolph of Nassau for all the other princesses. Tiaras are a bit harder to make out. It looks like the Citrine / Topaz and Pearl Tiara for Princess Alexandra; one of the amethyst tiaras for Princess Tessy; something new (?) plus some major necklace and earrings (also new?) 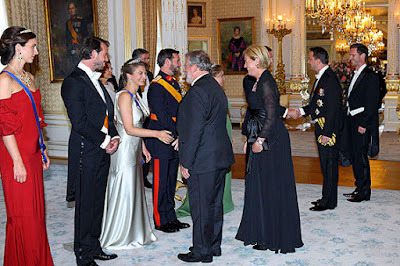 for Princess Claire; the Grand Duchess Adelaide Tiara for Hereditary Grand Duchess Stéphanie; and the Grand Duchess possibly in the Belgian Scroll Tiara.